You must make reservations at least 5 minutes in advance of the time at Vinaigrette - Santa Fe. Parking available in front of the restaurant, on the South side of the building and in an adjacent lot to the north. Vinaigrette is a chic and green Santa Fe bistro that raises the "salad bar" with bold and delicious entrée salads. 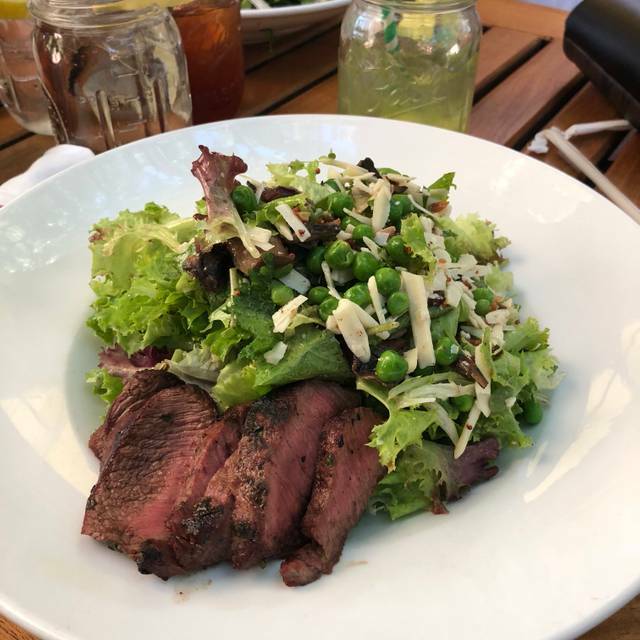 Featuring innovative flavor combinations and the option to add savory protein accompaniments like diver scallops, lemon-herb chicken or grilled hanger steak, these tantalizingly hearty yet healthy creations allow for guiltless and delicious eating at the same time. Much of the restaurant’s organic produce is grown on owner Erin Wade's 10-acre Nambe farm, Los Portales, harvested within hours of arriving at Vinaigrette's kitchen. When not grown at the farm, the restaurant strives to source local and organic ingredients. As one local publication put it "Eating well never tasted so good." Fresh baby greens and arugula tossed with tangy goat cheese, chopped pistachios, balsamic roasted beets and honey-balsamic vinaigrette. Vinny pick: grilled artichoke hearts. Grilled pork tenderloin over baby arugula, julienned green apples, pickled fennel and sharp cheddar, chopped and tossed in a ruby port vinaigrette. A dressed up taco salad with chopped red cabbage and romaine, tomato and corn, green and red onion, seasoned beef and chorizo, cheddar and jack cheese with a cumin honey-lime vinaigrette. Vinny pick: roast chicken substitution. Grilled bosc pears, bacon crumbles, toasted pecan halves and tangy maytag blue cheese served with tender greens and ruby port vinaigrette. Vinny pick: hibiscus duck confit. Line-caught tuna, avocado, bell pepper, radish, red onion, celery, corn and romaine. Chopped and tossed in a tangy lemon-dill vinaigrette. Vinny pick: tuna steak substitution. Chopped napa cabbage and rice noodles, with julienned red bell peppers, scallions, shredded carrots, cilantro and peanuts. Tossed with zingy miso ginger vinaigrette and topped with crispy noodles. Vinny pick: grilled flank steak. 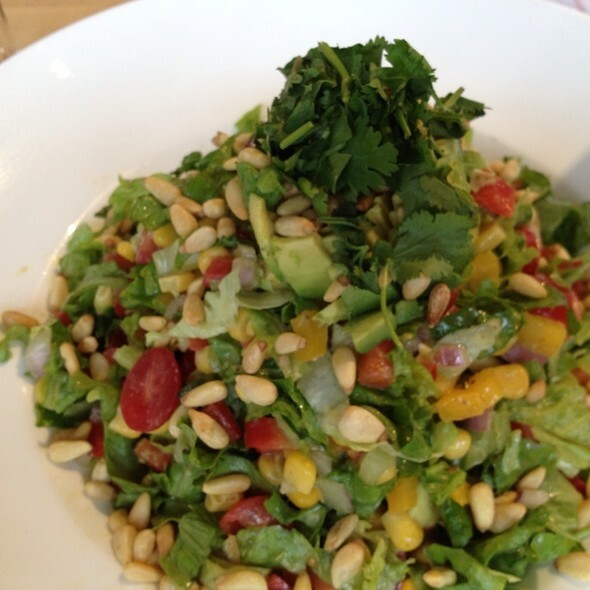 Leafy greens chopped and tossed with sweet corn, diced bell pepper, tomato, avocado, red onion, cilantro and toasted pine nuts. Dressed with blue cheese vinaigrette. Vinny pick: today's fresh fish. 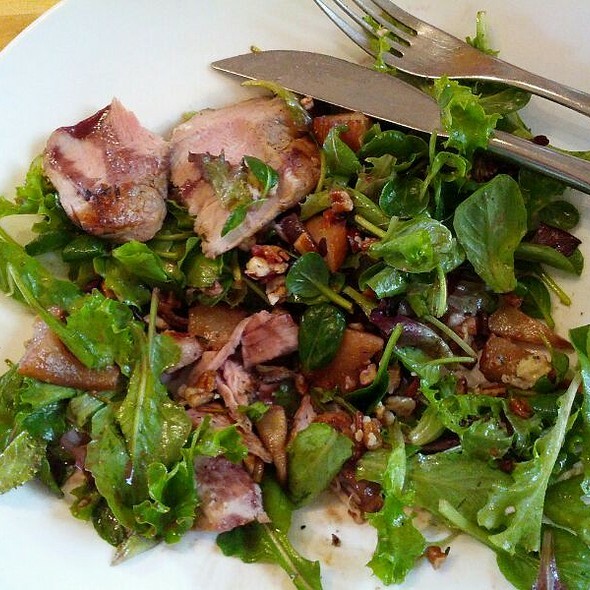 Duck confit tossed with baby arugula, creamy goat cheese, balsamic roasted pears and hibiscus vinaigrette. Fresh baby lettuce and sweet green peas with crunchy bacon shards, savory white mushroom sauté and asiago cheese with a tart vinaigrette. Vinny pick: lemon-herb chicken. Dried cherries, mild feta cheese, peppery baby arugula and toasted pecans with champagne vinaigrette. Vinny pick: lemon-herb chicken. Shredded super-food kale with a zingy, zesty lemon-anchovy vinaigrette, fresh parmesan and chopped marcona almonds. Vinny pick: today's fresh fish. Tomato, avocado, hard boiled egg, bacon, roast chicken and blue cheese chopped and tossed with fresh romaine and classic cobb vinaigrette. Tomato, bell pepper, crisp romaine, garbanzos, salami, roast chicken, and provolone julienned and tossed in a creamy balsamic dressing. 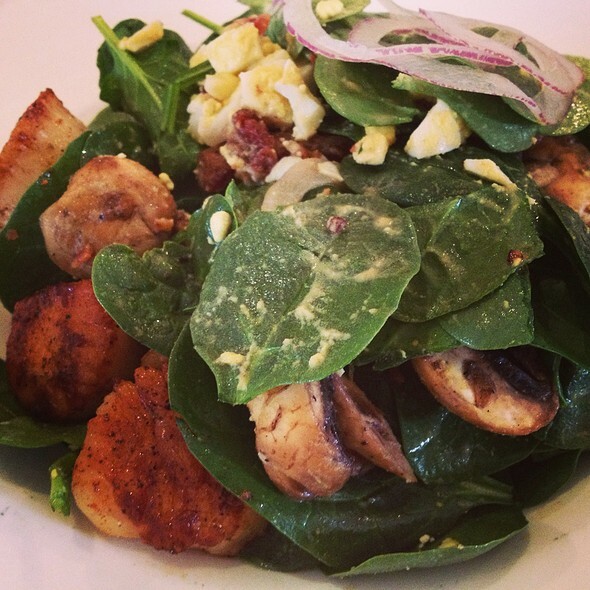 Baby spinach tossed with sautéed mushrooms, bacon, hardboiled egg pieces, slivered red onion and honey balsamic vinaigrette. Vinny pick: seared diver scallops. Chopped cucumber, tomato, bell pepper, red onion and crumbled feta cheese. Tossed in our classic vinaigrette. Vinny pick: grilled shrimp. A bright mix of baby greens with shaved carrots, cucumbers, tomatoes and pickled fennel. Tossed in a zippy romesco dressing. Flash grilled romaine hearts, scallions, and red onion slivers tossed in a lemony caesar dressing with freshly grated parmesan reggiano and croutons. Vinny pick: seared diver scallops. French bistro staple with frisée greens, poached egg, bacon lardons and a warm shallot vinaigrette. Vinny pick: hibiscus duck confit. Fire-roasted sweet corn, cherry and grape tomatoes, diced red onion, cilantro, feta and a chile lime vinaigrette. Vinny pick: grilled flank steak. With pickled shallots, warm anchovy-rosemary vinaigrette and a crostini. With extra-sharp cheddar, jack and asiago cheeses and served with sliced fruit and veggies. Balsamic marinated garbanzos and tangy hummus, served with grilled ciabatta wedges and crudité. With grainy dijon, local honey and fresh rosemary. With cilantro, lime, chile, touch of honey. With breaded herbed eggplant, fresh mozzarella & housemade marinara. Served with side of garden, greek, omega or caesar. House-roasted cumin-rubbed turkey breast with griddled red onion and tomato, fresh sliced avocado, mayo and provolone, on toasted sourdough. Savory corned beef griddled and layered with tangy sauerkraut, spicy russian dressing and swiss cheese on toasted rye. Mustard-roasted pork shoulder and green chile ham, griddled with red onions and swiss cheese on a split roll with avocado and mayonnaise, chipotle and sweet relish. Roasted bell peppers, onions and squash griddled with basil aioli and provolone, on sourdough bread. Line caught albacore tuna with capers, chives, mayonnaise and swiss cheese, sourdough bread. Classic gumbo with andouille sausage, shrimp, chicken and rice. Hearty miso-based vegan stew with a blend of forest, button and porcini mushrooms. Ask your server for today's special soups. Made with fresh lemon and topped with raspberry coulis. 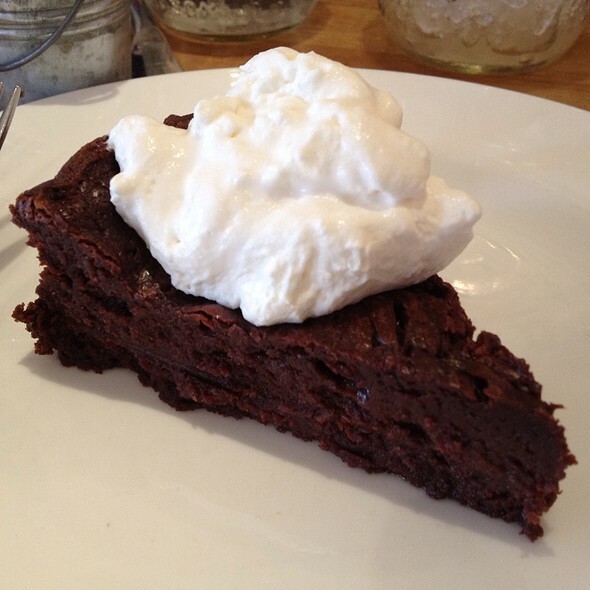 Impossibly moist, dense yet light, with a whipped cream cheese frosting. Baked daily ask server for today's fruit attack. Add a scoop for an extra sweet treat. The restaurant beer and wine list changes frequently to allow our guests or enjoy a variety of our selections. Our salads were delicious but the service was terrible. It seemed to be just us - others were getting their food on time. 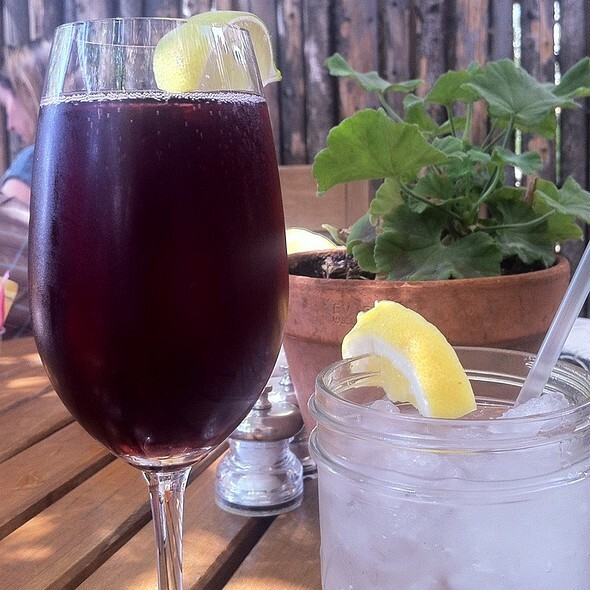 We had dined at Vinaigrette several times during previous visits to Santa Fe. We were currently here with family and had raved about this restaurant. We went there our last night together and were horrified with the food and the service. Three out of four of us ordered the pea soup. I must say it was delicious, and the only positive portion of the evening. The macaroni and cheese was horrible. Kraft’s version is much better. And, my husband had to ask 3 times for his kale and black bean nachos before it arrived toward the end of the meal. And, part of my dinner landed in my lap when served. We left quite annoyed. Because my husband and I were staying across the street, we decided to give it another chance the next evening. We had to ask for bread. The salads were good...not great. And, our waitress (different from the night before) treated us with indifference as if we didn’t matter. There will not be another visit. I cannot recommend this restaurant. Everything about it was amazing!! Totally cute space, great waitstaff, sustainable, and delicious. And I’m not a huge salad fan but I’d go back! We've been going to Vinaigrette for years now--- mostly for lunch, though. Dinner was a less enjoyable experience---- service was pretty lame (apathetic server, slow to even acknowledge us, etc.) and the music was too loud for decent conversation. The restaurant felt chilly, too. That said, we still love the menu and the salads, even though it seems like the serving portions have gotten smaller while prices have risen. My pinot noir was good, too! Great window spot for us two. Lovely water jars. Fresh flowers. Cute sit. After 6 hours on the road we stopped for a great meal, 2 HUGE salads and were seated immediately and server was attentive and engaging. Highly recommend for a filling meal! A delightful evening with friends, fresh salads and indulgent desserts! Great place for tons of vegetarian and vegan options. The desserts are also reliably great -- especially the carrot cake! Service is in line with the casual style of the place. Sometimes I just wish a server would be willing to write stuff down -- there's no shame in notating an order, at least in my opinion. We weren't offered bread or asked it we wanted it, didn't realize that till later. If they could find a way to do one of those "tented door" options at their side door, it'd be a whole lot more pleasant on cold winter nights/days. Right now every time someone opens the door, there's a big draft inside. Inside ambiance is very casual (some benches, some chairs) so as long as you aren't expecting cushions and tablecloths, you'll be fine. We've been here maybe a dozen times and will always return. I was extremely disappointed with the salad choices. The waiter highly recommended a salad that was one of the higher priced offerings. It was supposed to have many interesting ingredients, but, when it arrived, it was 99 % greens. I resent paying that much for ordinary greens! We loved Vinaigrette! The menu is very healthy and the menu unique. Our food was excellent as was the service in a cozy and casual setting. We will be returning soon. A great place for dinner if you are looking for the lighter fare of soup & salad. A bit pricey so be prepared. Food was excellent - however, as stated by others, several items not available. Service was pleasant and attentive. Consistently good - food and quality, low key ambiance. Service not quite as good as usual -- minor things, such as not refilling water glasses and asking for bread and butter but getting bread and oil, but this makes a difference when we had invited out of town guests to join us. Great restaurant for having a lighter meal. We had been attending a conference in Santa Fe and eating a lot of delicious New Mexican food, which can be heavy. We went to Vinaigrette today for a change, because we wanted something lighter. We loved it! Their salads were huge and delicious, soups were very tasty and sandwiches were fantastic too. Definitely a place that I would like to come back to. Great place! Food was fabulous! Service was outstanding too! 5 star!! Great place for a casual meal for lunch or dinner. The soups and salads are home made and delicious. 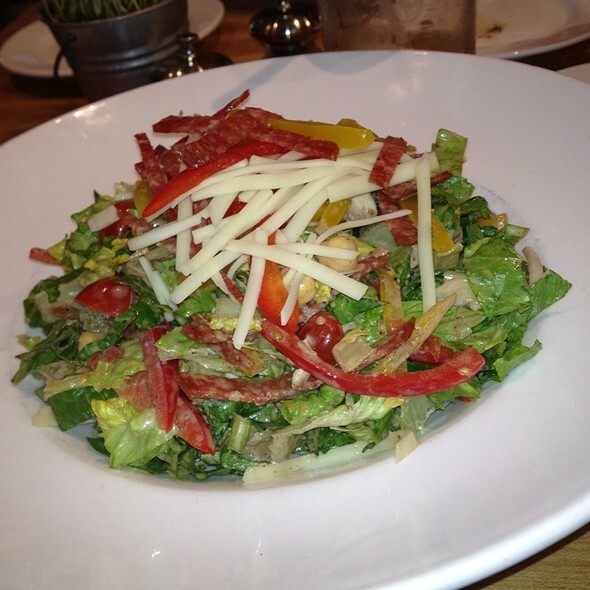 The salads are huge with a mix of fresh ingredients and just the right amount of dressing. The mushroom soup was super with tons of mushrooms. Service is always good. We had a great meal and the variety of salads was great. I would definitely recommend this to anyone looking for a healthy choice. The food, quality and presentation were outstanding. From the atmosphere to the perfect noise level it was a wonderful evening to spend with locally sourced menu ingredients mixed to make our meal spectacular. We're excited to learn of another location in Austin, TX just a few miles up the road from our home. Thank you for a great evening. After eating at many local restaurants on our recent trip to Sante Fe, we were looking for something a bit lighter. Our innkeeper recommended Vinaigrette. What an excellent choice!! Great selections from which to choose. I had the grilled romaine with scallops and my husband had a turkey sandwich with side salad. Both were very good. Would recommend. Here’s the thing. We arrived early and were told to sit anywhere. We told the hostess we had a reservation and I gave her my name. We had an okay dinner with a waitress a bit too cool to chat. Then after leaving I got a scolding email from Open Table telling me how rude it was to not show up for a reservation. Excuse me. What happened to the customer is always right or at least presumed to be right. I’m going to now delete the app. I’ll call for my own reservations and find more welcoming spots. Vinaigrette was wonderful as usual. I had house guests, one from DC and one from Seattle, and we ended up going there twice. They were very impressed, especially with the extensive selection. I tried one of the daily specialties with Kale and I found the black beans in it a little too starchy. 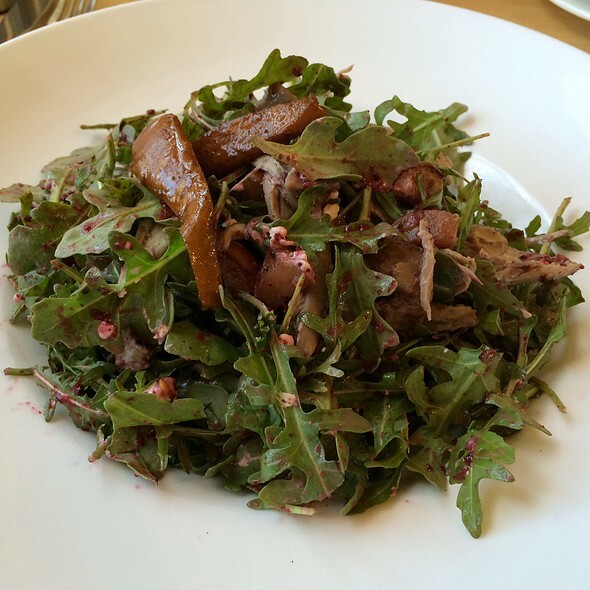 The second time I tried the Arugula Duck and it was fabulous. I particularly loved the mushroom stew. The staff was careful to address my allergies. The ginger/turmeric drink was very satisfying. My only complaint is with their benches at some of the tables. I find them uncomfortable. Luckily we were able to get tables with chairs both times. Unfortunately it was too cold to use their patio which I find charming. Best salads in Santa Fe. Outstanding patio seating. Carrot cake is phenomenal!! Waitress never checked on us after meal was served. My dining partner ordered a Tuna Melt and received a chicken sandwich. We could never get our waitress's attention. We had tickets to the theatre and arrived at 6:30PM, had to leave by 7:40PM. I ended up going into the restaurant and asking another wait staff person to allow us to pay the bill. This hasn't happened there before, but it will be a long time before I would consider going there again. They need to improve their service. We enjoyed the restaurant so much that we returned for a second time during our five day vacation in Santa Fe. Great selection of salads and sandwiches. If you want a break from heavy meals this is the place to go. Something for everyone. Beer and wine only. Delish! As always, this is great place to have a fantastic healthy meal. I love this place. Will return again and again. Always prompt friendly service, fresh and delicious food prepared with care, which not just tastes good but feels good too! As always, the cuisine, service and ambience at Vinaigrette was wonderful. I never travel through Santa Fe without a stop at this restaurant. I've been coming to this place since it opened. Recently both my companion's dish and mine suffered greatly from overcooked meat. I suppose the chicken might have been forgivable but the so-called "seared" tuna was actually well-done and very dry (yuk). We asked the server, who was quite concerned, if there was a new cook in the kitchen, to which he replied that there was not. He made amends, but considering that the restaurant was not half full, we couldn't see why this should happen. I would be reluctant to return. Great salads! Never had a salad there that I did not like! Salacho is the best, freshest farm-to-table version of a taco salad you’ll ever eat. My husband likes the nutty pear-fessor. Iced tea is nice and strong, too. The taco like salad with ground beef had way too much cumin, even caesar dressing could not kill the taste. We had a delightful time - food was up to the usual Vinnie standard but most importantly, the service was actually good. I also felt confident that my gluten free needs would be addressed responsibly. We had stopped coming owing to spotty service. This was a refreshing and welcome change. I can always count on Vinaigrette for great food and service! Love all the salads! Tea also nice and strong! Patio nice. This is not usually a dinner choice for us, but sitting out on the patio made for a delightful meal. Servers are always VERY friendly and efficient! I would like to see another Chardonnay or two on the wine list. The best restaurant in Santa Fe very crowd! Healthy food. New food I am tired old fashioned restaurants. I went that restaurant 3 times last weekend. I will return back again. Highly recommend of this restaurant! Healthy food! We’ve eaten there many times and consistently have a wonderful meal and time. This time we went to celebrate a birthday on a beautiful evening where we could sit outside. Great ambiance as always.The only thing wrong, not discovered until later with leftovers, was a salad with bacon (had asked the waiter to leave it out and double the cheese). The vegetarian who had ordered this meal hadn’t eaten much of it and didn’t realize there were bacon bits in there, so it hadn’t ruined her evening. Very enjoyable and consistently excellent salads. I was disappointed that bread was not being served for the evening.